Anthony Prozzi is the Senior Interior Designer at Ford Motor Company and a recent speaker at the State of Style Summit, where I had the opportunity to sit down with the fashion expert and ask him a few questions. His answers were surprisingly bold and give an unexpected insight into the directional design that Ford is going – edgy, relevant, aggressive, and what Anthony refers to as a cerebral endeavor. During our conversation, I asked him about his current design aesthetic as well as how his time working for Donna Karan has helped shape his outlook on the design process. We also addressed the hot topic of sustainability and the environmental impact of the automobile industry and even touched base on what it means to be relevant in today’s market. Below are the questions and answers from our conversation. 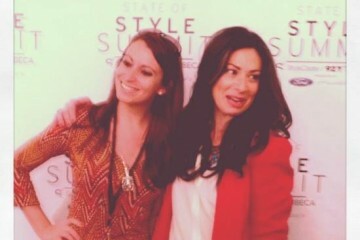 Q: I heard you say in your panel with Stacy London that you believe in ‘style without compromise’, what does that mean to you? A: When someone like H&M approaches designers and they produce clothing that’s accessible that in the past would cost thousands of dollars. Now more than ever, the public demands it. Because of writers, bloggers, websites, reality shows like Project Runway and my personal favorite, ‘All on the Line’ with Joe Zee on the Sundance Channel, people just crave it. The power that a designer has to be able to understand emotion and turn it into a 3 dimensional form be it a dress, be it an automobile, a piece of furniture and to do it in a way that everyone can enjoy and have access to -that’s the power of style without compromise. 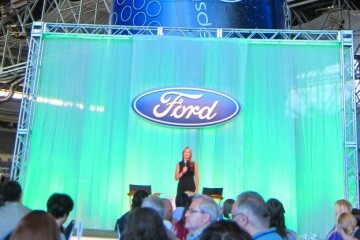 Q: How did working for DKNY shape your current career as the Senior Interior Designer at Ford Motor Company? A: Donna had taught me this idea of flow, transition, sensuality, and the sexuality of a garment; regardless of if it’s an article of clothing, or what I’m doing now with automobiles, those principles apply. So when I’m embarking on the interior design of an automobile, I look to the flow of it. What is the zeitgeist? More importantly, is it beautiful and pertinent? Does it apply to what’s happening now, but also ten years now? These are very philosophical and cerebral endeavors that I think have transformed design and style to what it is now from ten years ago and to where it will be ten from now. It’s about being conscientious and knowing what you’re doing leaves a positive impact on the world. Q: How important is sustainability and the environment to you when planning your designs? A: It’s the price of entry now; it’s no longer something we ask. It is the nature of business now, it has to be. It’s the nature of business now and will forever be, because of technology and innovation we’re able to solve those problems. Bill Ford Jr. recently said that within his lifetime, we may actually be able to see how to solve the environmental impact of vehicles on the environment completely. Case in point is the Ford Fusion. It’s a highly seductive sedan that is not offered as a v-6 – it’s 4 cylinder with an eco boost that still delivers the same performance you’d expect with a v-6, but all your miles per gallon have increased dramatically and there’s no compromise. We even take it a step further with offering consumers a choice – the hybrid or a plugin hybrid that offers even more miles to the gallon. Q: What are three words you would use to describe your design aesthetic? Q: Who is the type of person you have in mind when designing? A: Oh my Gosh. Right now my style style icon in Kate Lanphear from Elle. Everything she embodies – she has this incredible dichotomy. She has this sort of dark edge, but deep inside I know she has a great soul. Everything about her aesthetic, from her jewelry and her dog collar treatments, I find very intriguing. 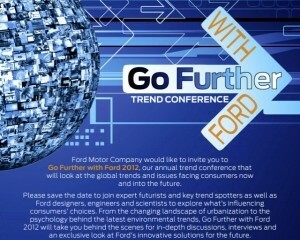 Q: How have you applied that to your designs at Ford? A: She’s all about this mix of leather and metal and incredible amounts of texture. When you look at the Fusion interior there’s an area on the passenger side where we’ve inserted this nihilistic (lethal a little dangerous) element. It balance the softness that plays around the rest of the interior. Q: What designers past and present influence your work? A: Alexander McQueen and I think we’re experiencing an Elizabeth Sanders moment. The protagonist like the girl from The Girl with the Dragon Tattoo. There’s a writer, its breaking my heart that I can’t remember right now, but she has a quote – “corruption offends her and it’s the desire to set things right that motivates her”. When I heard her say that I almost fell over because it’s sort of the mantra that we’re doing right now. We realize that you must do the right thing and it’s the need to do the right thing that motivates us. And fashion has really picked up on this; I mean if you look at the collections of Alexander Wang and Givenchy, its radical. Especially, when Givenchy presents his models with nose rings and piercings. Q: What does it mean to you to be ‘relevant’? A: It’s being able to understand the world as it is and being able to understand the modern consumer. More than ever people have access to everything with smart phones and the internet and because of that, companies must remain transparent. We will (emphasis on ‘will’) be held responsible for our actions. We are going to be judged for everything we do.